I’ve had two pints of raspberries languishing in the refrigerator since an impulse purchase at the store last week (they were on sale! ), so it was time to decide what to do with them. If I’d have remembered Smitten Kitchen’s Raspberry Breakfast Bars (from the Baked Bakery’s cookbook Baked: New Frontiers in Baking), I’d have made those. But I didn’t. I did remember that I’d recently purchased a copy of Alice Medrich’s Chocolate and the Art of Low-Fat Desserts, and have been meaning to try something from it, so I cracked it open and took a look. Aha! Raspberry Genoise. (Yes, yes, no chocolate. Still.) I’d get to a) use up the raspberries in something that wouldn’t cause me to gain ten pounds, and b) try out one of the genoise recipes to see what I thought of it. Win-win! 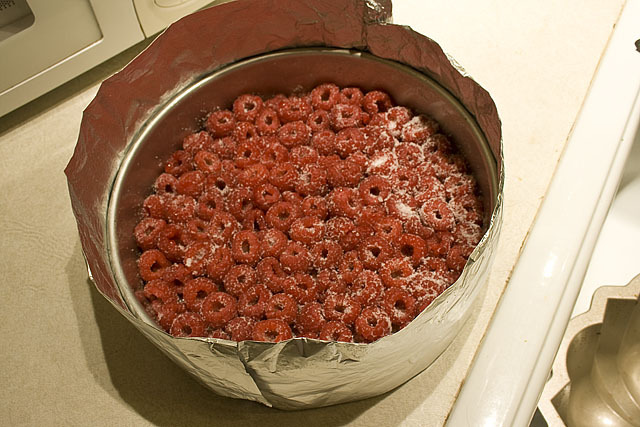 First step, sugar the raspberries and layer them in a 9-inch cake pan. Because I am just a tad OCD, I made sure they were all oriented with the openings up. Then, mix the genoise. The fiddly part of this recipe is heating the egg/sugar mix to lukewarm over the stove, whisking away. My arms, they are not happy about that this morning. Next time, I take the longer route and use the water bath method. Whisking bad. Whipping and folding went well (and ohhh, does browned butter with vanilla in it smell divine! 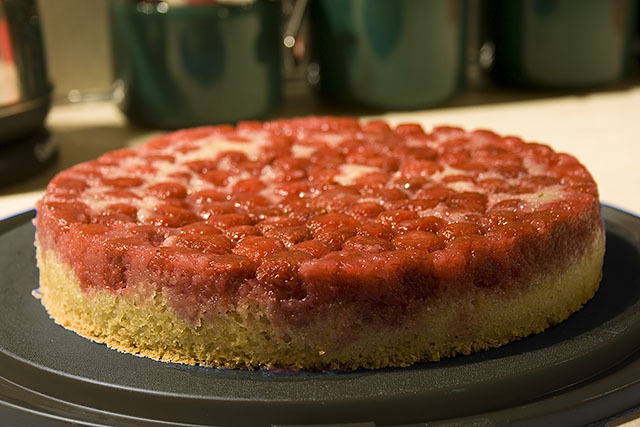 ), the batter was poured over the raspberries, and the whole thing went into the oven. Half an hour or so later, and here we were! I was a little concerned at the distinctly eggy smell emanating from the oven during the last few minutes of cooking. Was this going to turn out to be one of those rubbery low-fat cakes? I mean, I’m sure Alice wouldn’t steer me wrong, but still… However, not to worry. I could definitely tell that it was low-fat, mostly by texture – the cake is very light and soft, almost crumbly. Difficult to cut and remove a clean slice. But mostly, it just tastes light. As in, not heavy. Jeff’s comment was that it didn’t taste “substituted” – and it doesn’t! The flavors of the butter/vanilla are very delicate, just a hint, quite right. The juice from the berries soaked into the cake as it cooled, which was nice. It’s a nice, light, summery kind of cake – it would be perfect with a cup of tea. A full serving (1/10 of a cake) satisfied nicely, and for only 180 calories! I can definitely live with that! 1. Preheat the oven to 350F. If the cake pan is only 2 inches deep, make a foil collar. Tear off a sheet of aluminum foil about 30 inches long and fold it lengthwise in half and then in half again to make a long band 3 inches wide. Wrap the foil around the outside of the pan and fold the edges together tightly to form a collar about 1 inch taller than the pan. Spray the bottom and sides of the pan and the collar lightly with vegetable oil spray. 2. Use a large form to mix the berries lightly with 1/3 cup of sugar (or more if the berries are very tart). Spread eenly over the bottom of the pan. Set aside. 3. Place a strainer lined with paper towel (not a coffee filter) or 4 single layers of cheesecloth over a 3- to 4-cup heatproof bowl neat the stove. Melt the butter in a heavy-bottomed small saucepan and simmer until the loudest sizzling noises subside, butter turns golden brown, and particles brown. Pour through the strainer and keep hot until needed or reheat quickly before using at the end of step 6. 4. Combine the flour with 2 TB of the sugar and sift together twice. Return to the sifter and set aside. 5. In a large heatproof mixing bowl, use a whisk to combine the whole eggs, egg whites, and remaining sugar. Place bowl in or over a saucepan containing 1 to 2 inches of barely simmering water. Heat the eggs to lukewarm (check by touching), whisking occasionally. Or place the bowl directly on the stove burner and whisk constantly and vigorously for about 1 minute, until the eggs are warm. (This is the quickest, easiest way, but you must whisk eggs continuously to keep them from strating to scramble – not for those with RSIs). 6. Remove from heat and beat on high speed, preferably with a stand mixer, until the mixture has cooled, tripled in bulk, and resembles softly whipped cream. When it is nearly ready, reheat the butter briefly, if necessary, and add the vanilla to it. Set aside. 7. Sift about a third of the flour mixture over the eggs. Use a large rubber spatula to fold the mixture quickly but gently until combined. Fold in half the remaining flour, then fold in the rest. Scoop 1 heaping cup of batter into the bowl containing the butter and vanilla. Fold together with a small rubber spatula. When combined, scrape over the remaining batter and fold with the large spatula until well incorportaed. Turn the batter into the pan over the raspberries. 8. Bake until the cake shrinks slightly from the edges and the top springs back when pressed, 30-35 minutes. Cool the cake in the pan on a rack for 10 to 15 minutes. Slide a small knife or metal spatula around the edges of the cake to release it. Invert onto a plate. Lift off the pan. Allow cake to cool. Serve shortly after cake has cooled. Note: do not use a pan with removable bottom; juices will leak. Do not use a glass pan; the berries will overcook.